Believe it or not, it really is 2018 and we don’t know how to feel. Other than knowing we have to update all our calendars and create a different New Year’s resolution list, what is there to now look forward to for a few months? We’re in the “now what?” phase. Do things go back to normal? No, not at all. You can go back to your old norm but do you remember all the things you complained about then? You weren’t in love with your job, you hated the fact you’re a grumpy morning person, you didn’t feel healthy enough, and much more. Do you really want to go back to that or do you want to start fresh? 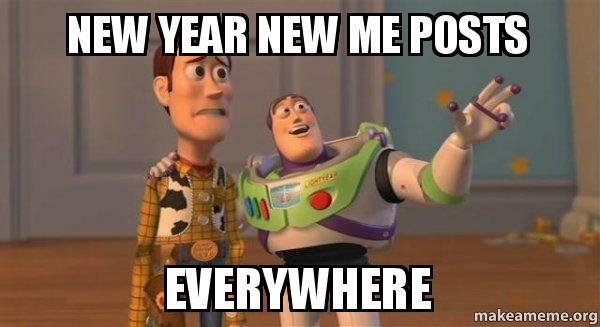 It’s a new year and it’s time for a more improved new you (*cue the new year, new me memes*). It’s time to acknowledge the changes you do need to make in your life and move forward with it. No more of trying to put together a never ending list only to never look at it again. Stick to what you say you’re going to do. How? The easiest and most successful way I’ve heard of doing this is by cutting your goals into bite-sized pieces AKA make your goals much more manageable than you make it sound now. You want to lose 10 pounds by the end of the year? Cool. How are you going to do it? What do you have to eat in order to reach that goal? Do you even know how to gym? There are overwhelming questions that come from such a huge statement that most of the time your mind just goes, “Yeah, lol no. Nevermind.” Slow your roll and take things one step at a time. “Trust the process” is something I’ve heard a million times before which I always brushed aside until late last year. Everything is a process and that includes reaching your goals. So, say you do want to lose weight or become healthier – first step (depending on your level of experience): reach out to someone who can guide you during your fitness journey. Second possible step: consider what you eat and make adjustments. Even those steps could have mini-steps to accomplish them. Everything is NOT unattainable. The only reason it would be is if you didn’t try. If at first you don’t succeed (first you don’t succeed), dust yourself off, and try again. Thanks Aaliyah for the lyrics of inspiration.